The story of a Grace College graduate who is involved at Community Grace Brethren Church, Warsaw, Ind. (Roy Chapin, pastor), is featured on the website of Silveus Insurance Group, where he works. It’s a story that also happens to be written by MariJean Sanders, GraceConnect’s editorial coordinator. A portion of the story appears below. Click here for the complete article. Also see the video story at the bottom of this page or click here. If you’ve ever had the opportunity to spend time with Henry Crans, 29-year old computer programmer for Silveus Insurance, you’ll know that he exudes a relaxed, warm presence. His easygoing demeanor and quick smile are infectious, and you’ll soon find yourself at ease. 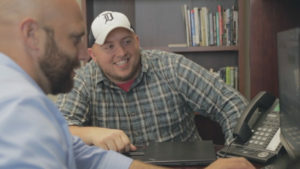 Crans has worked as a computer programmer for Silveus since he graduated from Grace College in January of 2011 with a degree in computer science. Henry was attracted to programming because of a keen interest in problem solving and the satisfaction that comes from creating something. Crans doesn’t just practice the art of patient investment at his job – this skill carries over into other areas of his life as well: for the past six years, he has been pouring into the life of a little boy named Alex. Big Brothers Big Sisters works by matching up a young person (their “Little”) with a mentor (“Big”) who shares interests and personality traits. Many of the Littles do not have a father figure and have an often difficult home life. Henry started meeting his little in 2010 and has been mentoring him ever since. So what does mentorship look like, day to day? What is it like to invest into the life of a child in a way that makes a lifelong impact? Crans and his Little meet up about every 3 weeks, grabbing a burger from Steak and Shake or playing tennis at the park, riding bikes and longboards on the trails, or playing a card game. The Power of Showing Up: Henry Crans from Mason Geiger Photography & Film on Vimeo.